Since 2007, Sports Injury Info has provided answers to general sports injury questions, and a community for Sports Injury Info visitors to find and communicate with others suffering from similar injuries. There are over 500 questions, answers, stories, and injuries submitted to the site. Chances are, your question may already be here. You can use the links below to find questions about specific body regions or injuries. I recommend browsing through others questions first. You can also use the search box below to find the information you are looking for. The most recently submitted questions are listed on this page - older questions are archived by body part - click the links below based on your body part to read through other questions submitted by visitors. With hundreds questions and stories submitted, your question may already have been answered. Dedicated to questions relating to patella femoral syndrome - treatment, rehab, prevention, and diagnosis. Also includes questions about surgical procedures like lateral release, arthroscopy for chondromalacia, and others. 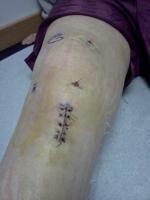 Questions about the ACL, MCL, PCL, and LCL - treatment, prevention, diagnosis, and surgery. From ankle sprains and fractures to tendonitis and surgery, this is the place to for your ankle and foot questions. Includes questions about shoulder dislocations, rotator cuff tears, shoulder surgery, and all other shoulder injuries. Hip flexor injury, hamstring strains, and many other injuries are all included in the hip questions section of the site. Find questions about the elbow, wrist, and hands. Could the pain ease up in a few days after you have had extreme pain in your shoulder from a torn rotator cuff?